These intricate, hand crafted mats are inspired by the meditative forms of mandalas. Inspired by the contemplative compositions of mandalas—cosmological symbols from Hindu and Buddhist traditions—these mats are intricate, individual works of art. Each one is hand crafted from upcycled fragments of fabric by women in Thailand, keeping textile waste out of landfills while supporting the artisans' economic independence. 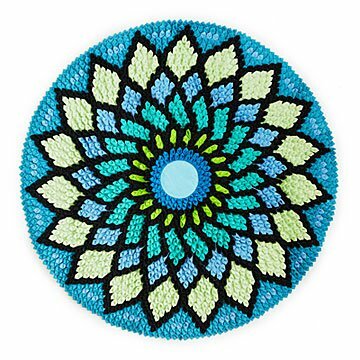 Invoking mandalas' geometry of balance, harmony, and unity, these colorful mats will add a compelling dimension to your foyer, kitchen, or office. Handmade in Thailand. Machine wash in warm or cold water; tumble dry.